"I never wanted fame. I just became a Kennedy." That's an iconic quote from Natalie Portman in Jackie, an absolutely amazing biopic. Portman portrays First Lady Jacqueline Kennedy, who is reeling after the assassination of her husband, President John F. Kennedy, in Dallas on November 22, 1963. She reflects back on her time in the White House in an interview with Life magazine journalist Theodore H. White (played by Billy Crudup). She also looks to her brother-in-law, Robert F. Kennedy (played by Peter Sarsgaard), & her secretary, Nancy Zuckerman (played by Greta Gerwig) for guidance. She is also struggling to plan the funeral & wondering how to tell her children, Caroline & John Jr., that their father is dead. During this time, she also has a crisis of faith, & wonders how her husband will be remembered. 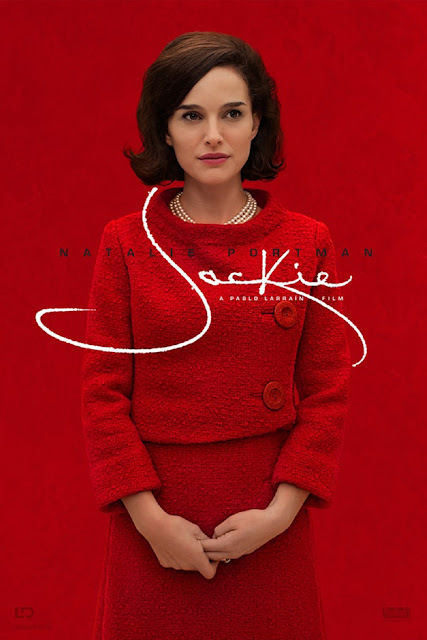 The cast is great, with Portman giving one of the best performances of the year. Pablo Larraín's direction is phenomenal (with this being his first English-language film). Noah Oppenheim's screenplay is brilliant. The film editing by Sebastián Sepúlveda is excellent. The cinematography by Stéphane Fontaine is absolutely breathtaking. The production design by Jean Rabasse is beautiful. The costume design by Madeline Fontaine is amazing. And the film score by Mica Levi is excellent. This is definitely one of the year's best films, an absolute masterpiece about one of the most influential people in our country's history.